Leek 'Hannibal' is one of the best selections of the Autumn Mammoth type. It gives excellent yields of thick, medium long, white shanks with dark green erect leaves. With good resistance to bulbing, it gives a good crop for harvesting over a long period and has good shelf life performance. Hannibal is an early variety, maturing in 125 days, 75 days from set out. They retain their mild flavor all the way to uniform, mature sizes. From the earliest sowings they can be ready for harvesting as early as July to August, and later sowings, September to late November. It is an ideal variety for baby leek production and can be grown under cover for early cropping. Grown closely packed, they can be harvested early as baby leeks from early summer or left to mature into long white shanks. If possible, prepare the soil for planting in the winter. Dig the site well, removing weeds and working in plenty of well-rotted manure to improve its ability to retain water. Leeks can be planted in heavy soil, but improve the drainage by mixing in some horticultural sand. This is a hungry crop – spread a general balanced fertiliser over the soil a week or so before sowing and rake in. A rate of 60g per square metre is ideal. If you live where the autumns are long and cool and frost is rare, you can plant two crops. Sow the first crop 12 to 14 weeks before the last frost in spring. In mid-July, sow the second crop indoors. If your area could experience frost during the winter, plant a frost-tolerant variety for your second sowing. Sowing: Sow seeds indoors 12 to 14 weeks before the last frost date. You can direct sow without the need to transplant, or sow densely for delicious, succulent mini leeks. They are not winter-hardy but will handle a light frost and will stay ready for use until Christmas. Sow the seeds thinly and evenly 6mm (¼in) deep in moistened potting mix and cover them lightly with vermiculite or sand. Keep the soil temperature at about 22°C (70°F) until the seeds germinate. Move the seedlings under grow lights or into a very bright window. Thinning the seedlings will encourage more rapid growth, but it isn't necessary if you keep them well fertilized. When the grass-like seedlings get to be 15cm (6in) long, cut them back by 4cm (1½ to 2in) You can use the part you cut off as you would chives. Harden off the plants before transplanting into the garden starting in late April or early May (the plants will tolerate light frost). You can also transplant later or sow seed directly outdoors for smaller plants. Drop the leek seedlings into the holes leaving just the tips of the leaves showing. Do not fill in the holes or try to cover the roots with soil or even firm them in. Just fill each hole with water from the watering can and this will wash some soil over the roots and be just enough to tighten the little plants in. Over time the holes will fill up gradually. On the allotment seeds are best sown in rows, 35 to 40cm (14 to 16in) apart. Mark a straight line and use the corner of a rake to make a shallow groove in the soil, about 1cm deep. Sow seed thinly along the trench, cover with soil, water and label. When seedlings have three leaves each, about four to five weeks later, thin to leave plants every 15cm (6in) the seedlings you remove could be used to plug gaps elsewhere. Keep the leek bed moist in dry weather and hoe regularly to keep the weeds down. Except for exhibition plants there is no need to feed the leek plants. But if you want to be sure of a good crop you can feed with weak liquid manure and hoe in a small dressing of nitrate of soda. After the holes the leeks were planted in have filled up, push some soil up to the stems with the hoe. This will make sure you will have a good length of white (blanched) stem. Do this earthing up gradually over a period of three weeks because if done too much to soon, the leek plants may rot. Mulch will help to retain moisture over summer. Pull up as and when required. Harvest them by lifting carefully with a fork, aiming to avoid damaging neighbouring crops. Beet, carrot, celery, garlic, onion, parsley and tomato. You’ll find several leek varieties in seed catalogues usually grouped by harvest time: Summer, Autumn and Winter. 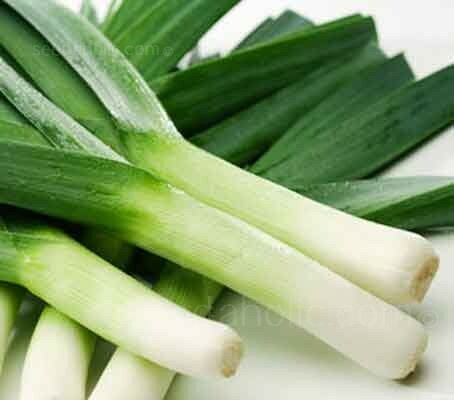 Most leeks can be harvested over a long period of time; in fact, the most cold-hardy varieties will maintain their good quality for months in the ground. The most cold-hardy leeks, and best candidates for winter and spring harvest are usually the ones with the longest “days to maturity.” Other clues to cold hardiness include leaf colour and length of “stem” (the tender, white portion). As a rule of thumb, leeks with blue leaves and short, thick stems survive winter better than those with green leaves and tall, slender stems. Sow seeds indoors 12 to 14 weeks before the last frost date.